Review of Scale Plans No. 40 Mitsubishi J2M Raiden "Jack"
The J2M was designed by Jiro Horikoshi, creator of the A6M Zero, to meet the 14-Shi (14th year of the Showa reign, or 1939) official specification. It was to be a strictly local-defense interceptor, intended to counter the threat of high-altitude bomber raids, and thus relied on speed, climb performance, and armament at the expense of manoeuvrability. The J2M was a sleek, but stubby craft with its oversized Mitsubishi Kasei engine buried behind a long cowling, cooled by an intake fan and connected to the propeller with an extension shaft. Teething development problems stemming from the Kasei engine cooling system, and the main undercarriage members led to a slowdown in production.A continual set of modifications resulted in new variants being introduced with the ultimate high-altitude variant, the J2M4 Model 34 flying for the first time in August 1944. It had a 1,420 hp Kasei 23c engine equipped with a turbo supercharger (mounted in the side of the fuselage just behind the engine) that allowed the rated power to be maintained up to 9,100 m (29,900 ft). Two upward-aimed, oblique-firing (aimed at seventy degrees) 20 mm cannons, mounted in the German Schräge Musik style, were fitted behind the cockpit with the four wing cannons retained. Unresolved difficulties with the turbo supercharger caused the project to be terminated after only two experimental J2M4s were built. Mushroom Model Publications is a company based in the UK. They have all their books printed by their associate Stratus Publications in Sandomierz,Poland in the English language. Stratus also does their own line of books in both Polish and English. This plan is one of a series of aircraft plans that MMP does. This set of plans comes in soft-cover of 10 pages in 16 1/2" x 11 3/4" page format, with each page folded in the center to fit the 8 1/4" x 11 3/4" cover. The cover art shows a black and white photo of 2 Raiden's parked on a runway. The one in the foreground wears a belly fuel tank and has the code of a Japanese character followed by 1105 in light colored lettering on the sides of the rudder. The second Raiden also has the same Japanese character followed by 1103 on the sides of its rudder. This photo is on a dark green background that has a top and side yellow line drawing of what I believe is a Russian Yak-9. The back cover repeats the line drawings. For 1/72nd and 1/48th scale line drawings there are: the J2M prototype 14 Shi, a J2M2 early and late, a J2M3 model 21, a J2M4 model 32 (2 drawings), a J2M4 with supercharger, a J2M5 model 33 with 30 mm cannon in the wings, a J2M6 model 31 with inner fuselage bulkheads illustrated and 30 Kg and 60 Kg bombs and a J2M3 model 21 as a 5-view with fuel tanks. 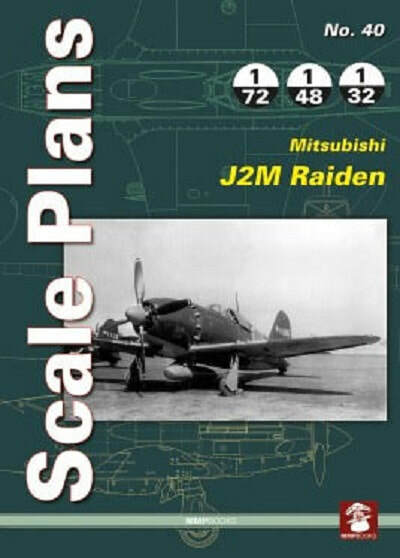 For 1/32nd scale a J2M3 model 21 again as a 5-view with illustrations of fuel tank. This set will be of great interest to modelers that have AMS (Advance Modelers Syndrome) and also to aviation historians.